This Atari surprised me when it first booted up, as an attractive GUI appeared despite the fact I hadn't inserted a disk. A bit of research revealed it was the desktop, GEM, handily stamped into ROM. Wow! Neat. Running with an 8 MHz Motorola 68000 CPU (same as the Macintosh and Amiga) the Atari 1040 model was the first micro to have a whopping 1 MB of memory in its base configuration when released in 1986. This FM variant I have came out the year after. By that time the 1040ST had tided itself up a little, having the power supply unit built in the case, and sporting a RF modulator for those without Atari monitors. With MIDI ports to spare this model gave wings to digital musicians and well as being a late 80s gamer's hog! This is a sleek little number, and is in excellent shape. 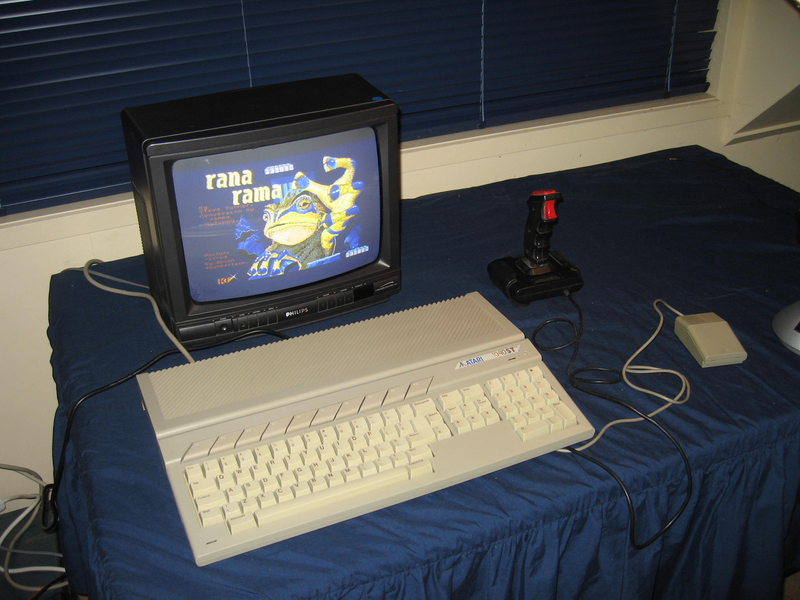 I can't help comparing it to my Amiga 500, which came out the same year. I haven't played with it enough to say whether I like it MORE than the Amiga, but I am impressed with the fact there is less clutter (no separate power supply or Video adaptor needed), and the desktop is in ROM. I've read that the Atari 1040 did indeed go head to head with computers like the Amiga 500 in the marketplace. In fact, such was the rivalry between the two camps things would get ugly, particularly on BBS's. Unfortunately by that time I was a boring old fart with a totally lame 286 PC compatible running EGA so I missed out on all that fun! One interesting feature of the machine is the fact that the mouse and joystick plug in underneath the unit and the cords extend out the front!? This is not common on a micro, where they are more likely to be at the side or back. Makes sense I guess especially with the joystick, where it would give you just a bit more length away from the console when playing games. So, another notable in the stack. I've got lots of software for it and have recently snagged a user manual.